A few weeks ago I wrote a post about my family’s history with cameras. Paula from Stuff I Tell My Sister, commented and told me she wanted to send me an old Brownie camera for my collection. A few days later this baby arrived – it was a bit dusty, but in great shape. 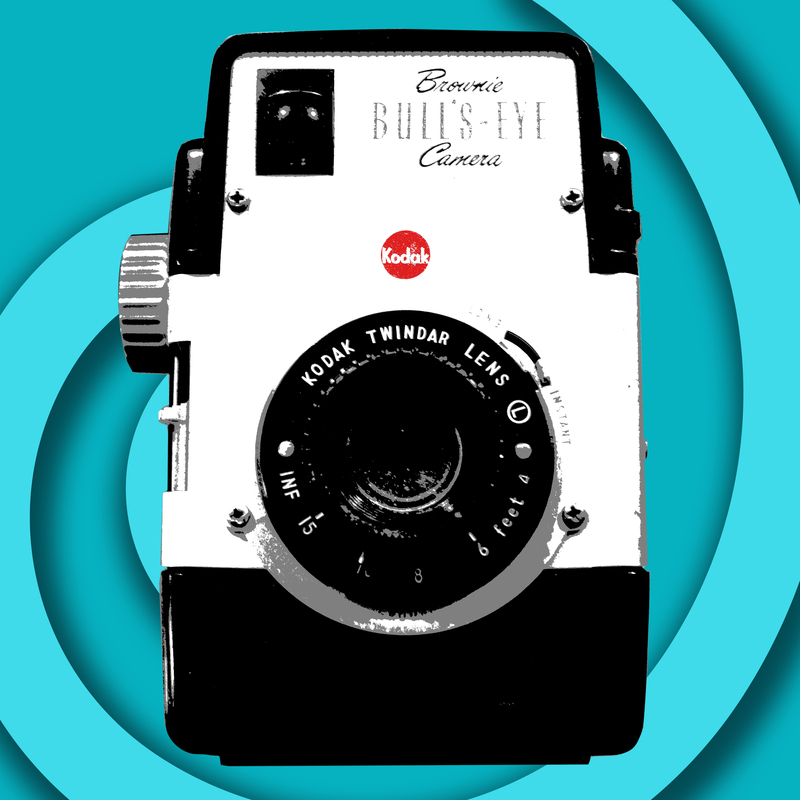 As I turned the knobs I heard the distinctive sound of film advancing inside the camera! I have been shooting some film this year so I carefully removed it from the camera. I emailed Paula and told her there was film, thinking this could be an old family camera – she told me that it was a flea market find and had no idea of what could be on the roll. 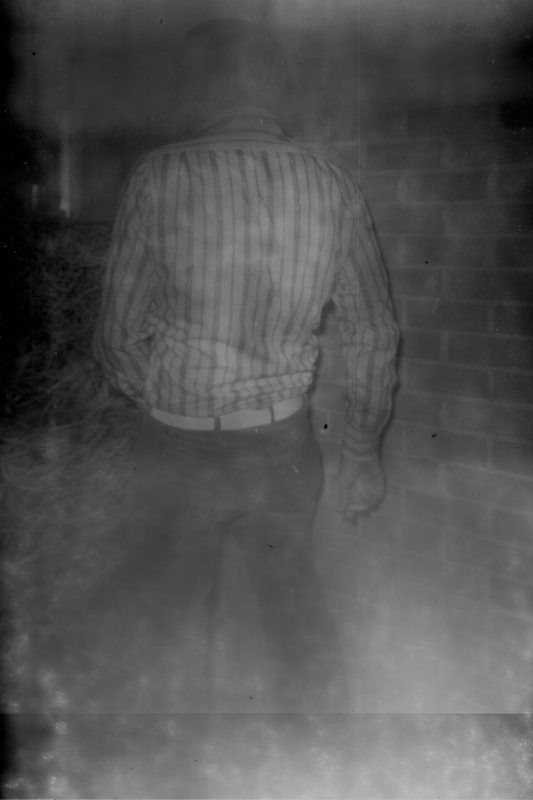 The label said Verachrome 620 – it was wider than my 120 Rollei film. I dropped it off that weekend with a roll of 35mm at the camera store. Ironically they had to ship the roll to Oklahoma – Paula’s neck of the woods – to the only lab in this part of the country that could process it. On second thought I think I will make up a story – a story about a boy named Billy. His mom is a Dolly Parton look-alike – his nana is a waitress at Mel’s Diner named Flo. There is a special party guest who bears a striking resemblance to Sam Donaldson. Happy 4th Birthday, Billy ! Enjoy the spotlight – hey, isn’t it past your bedtime? 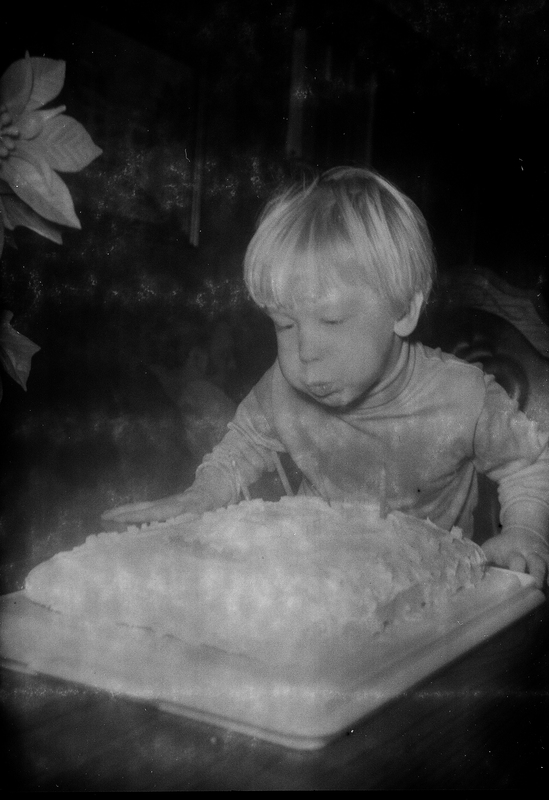 Look at those cute chubby cheeks – I count 4 candles. Noting the poinsettia on the left, either Billy’s mom has neglected to take down the Christmas decorations – or he is one of those poor unfortunates with a birthday at Christmas time. Either way, it looks like party time is about over for you, Billy. Night night. The kid’s birthday is clearly an event that calls for a visit to the hairdresser for Flo and Dolly. Aqua Net, polyester and some drinks – time to get our party on! Mother and daughter clearly share the same hairdresser. 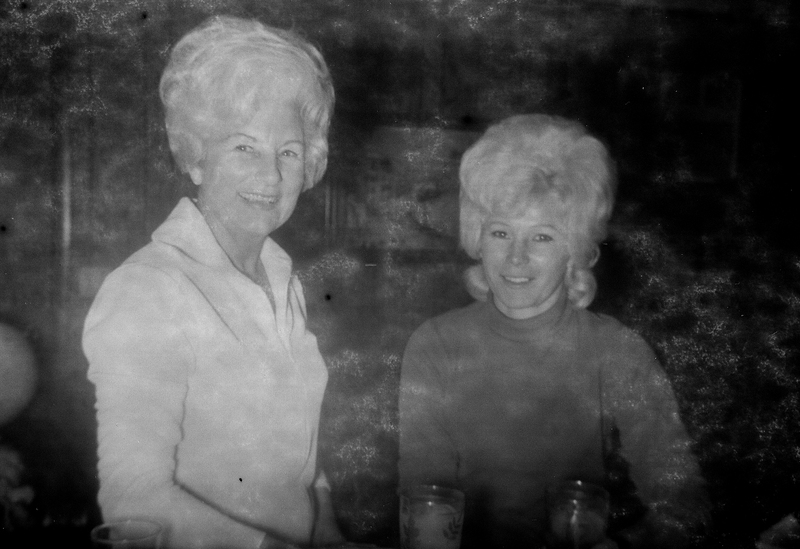 Flo wears her hair in an updo, while Dolly keeps those youthful ringlets at her collar – both women are clearly familiar with a ratting comb and Aqua Net. Pop Culture Note – In the 1960’s women believed that helmet hair was a good look. Oh Sweetie – that is one serious comb-over! Is that your hand in my armpit? Now that Billy has finished his cake and gone off to bed – it seems a visitor has stopped by – a visitor with and impressive comb-over. Sam seems to take a shine to Flo as he drinks a Big Gulp sized drink. A 2 drink minimum at this party could be scary. Here’s an even better shot of Sam’s comb-over. 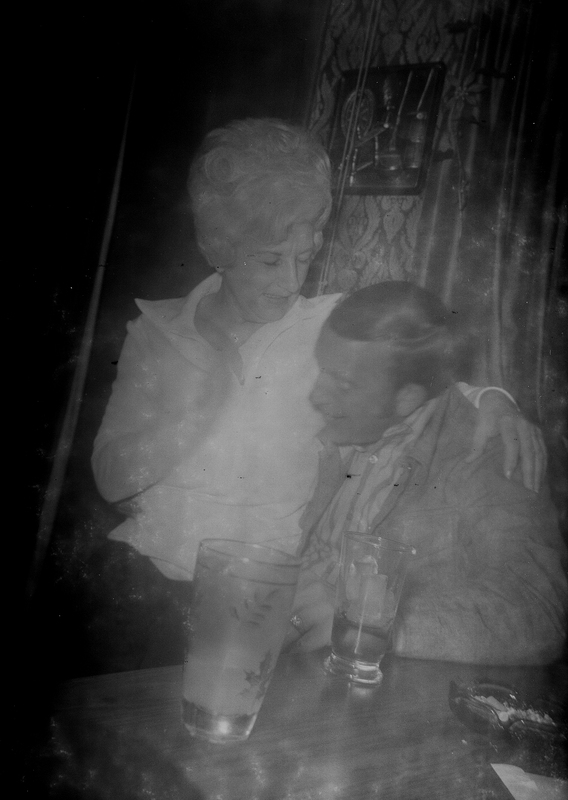 Interestingly enough, Flo is no longer on his lap – that honor now belongs to Dolly. Sam’s drink looks like it’s in need of a refill. Apparently Sam has had enough to drink and steps outside to relive himself. Note his stylish white belt and bell-bottom cords. Flo is back on the lap and admiring that comb-over. The highballs are apparently served in tumblers at this 4-year-old’s birthday party. This shot shows the nuance of the wall decor – looks like a fine painting of a spinning wheel over some velvet brocade wallpaper. Sam comes back inside and Flo takes her place in his lap, drinks are refilled, Billy is forgotten. The party continues – was it someone’s birthday? The last shot isn’t really a shot at all. It’s a mass of smudged fingerprints. No clue of who they belong to – Flo? Dolly? Sam? Billy? Did Sam bring Billy a present? Did Flo know that Sam was two-timing her with Dolly? Did Dolly know that Sam took a leak in her shrubs? Who took the photos? Who knows? This entry was posted in Film Photography, Photography, Reminiscences and tagged Aqua Net, black and white photography, comb-over, Film Photography, Kodak Brownie Bullseye, Lomography, polyester, Silliness, Trachtenburg Family Slideshow Players, Verachrome, Vintage Camera, vintage film by artsifrtsy. Bookmark the permalink. Love the brownie story. You ask some very good questions, and therein lies the WHOLE story, yet to be written by you! hahaha Your story is much better than the video of the family singers! You are the one who should go into business. LOL – I feel bad for that little guy – not much of a birthday celebration. Not sure there’s much of a call for stories made up about mystery people – who knows? Well, I can’t seem to throw a photo away. I always want to know who it was. Recently I found a photo that was of my grandmother’s first husband. I knew she had been married but had no idea of what he looked like. It turns out he was a childhood friend and there were tons of photos of him in her old family snapshots. How interesting! No children by that marriage, I assume??? Omg, these are awesome! I love stuff like this! What a fantastic story; and to think these people have never seen these photos of those moments in their lives. What a great find! Who would have thought such odd things were in there, just waiting to be developed? It reminded me of silent movies. Absolutely a joy to see and read …don’t know why but Texas popped into my head instead of OK while looking at these. What a wonderful gift and wonderful talent you have. I was thrilled to see 60s style – I have read some articles about amazing photos forgotten inside cameras – I guess I was lucky to get some funny ones. It’a amazing how much smoking there was in the 60s. What a find! The hair! I so remember those teased up piles of fluff, stiff with Aqua Net. The cloudiness makes it look like the air was filled with cigarette smoke. Another Friday night with Scotch and Marlboros – These could have been taken in any living room anywhere. Your captions crack me up. I was wondering where you’d been all week. Now I know doing some investigating. 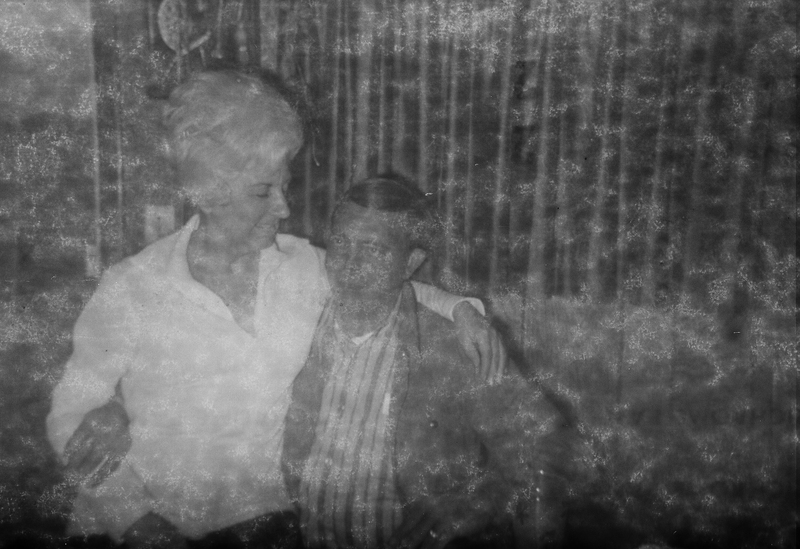 Lol – that haze does look like the cigarette smoke that filled our living rooms in the 60s – I think I have a shot of my nana holding me and a cigarette as an infant. Totally ok in 1962. I have been offline for a bit. A week with old friends has morphed into a complete bathroom remodel. The house is complete chaos – but the plumbing is working again. Oh, you have been having fun! Yep, nothing wrong with smoking, peeing in the bushes, or staying up past our bed times back in the day! I remember my brothers peeing outside, but they were 4 and 6 and were never so stylishly dressed. Great post. 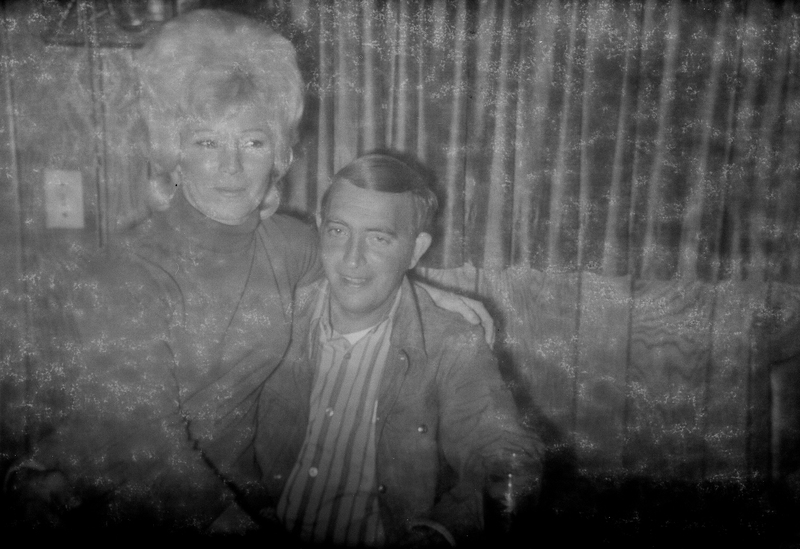 Somewhere I have 2 rolls of negatives that were in some old aluminum Kodak film canisters that my father found in a yard sale. You have inspired me to find them and see what I can do with them. Thanks! Allan, you gotta get them developed – I bet there’s gold in those canisters. I have seen some finds online that have pretty amazing. 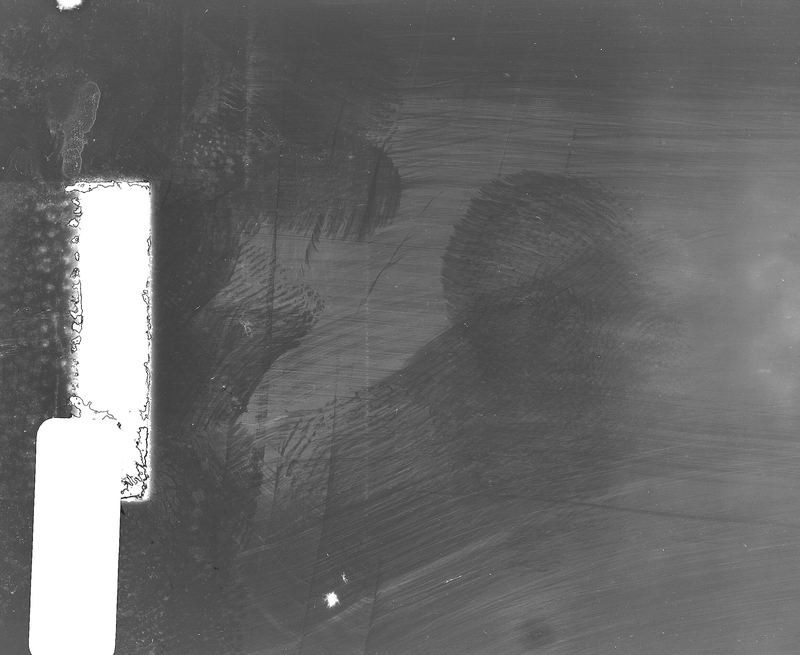 The negs are developed, they have been rolled up for 60+ years. The challenge is to flatten them out without breaking the film. How fabulous! Love that you could make up the story — and the fact the Trachtenburg Family have such a ‘unique’ voice makes it all perfectly sublime! Thanks Louise – the Trachtenburg Family was quite a find. They even made their stories rhyme! I LOVE this! Sam and Dolly are perfect in their discretion while celebrating the birthday of a small child and getting horny and bombed. Great post! It’s one thing to sneak around on Flo, it’s another to have your photo taken doing it. Oh what a night. I’m always amazed at what accidentally gets sent to secondhand stores, yard sales, etc. I’m sure somebody would have liked to have some of those pictures (except for Sam taking a leak – really, one highball too many). Nice back story, Lorri! Thanks Michelle – I did open all my old cameras looking for gold after this find. Alas, nothing. I’m thinking she’s not going to leave it to us … no, there’s the story. I just couldn’t leave it to you, but if you have an alternate version of events, I’m listening. That was defintely a hoot, Lorri. Wouldn’t it be even funnier if there was an elderly person out there (or a child, sibling or grandchild) who recognised the people on your blog post & contracted you. I thought about that – Billy should be close to 50 now. I would love to know the real story. 620 AND 120 are same size the only difference is the spool. Love the story anywho keep up the good work. I love your Billy, Dolly, Flo and Sam story and I love that slideshow thing. My daughter and I sit on the park bench and make up stories about people in the summer. We can’t hear what they’re saying to each other so we make up the conversations taking cues from their facial expressions and body language – it’s fun! We have fun – I wish we could secretly record them and our voices! probably but not sure it would be legal! What a hoot! Did you notice the guy with the sideburns in the background of the pic of Billy blowing out his candles? Good eye! Another adult ignoring poop Billy! I don’t think it’s Sam. Mmmm… no. Hard to say for sure, but I think it’s Carl. He’s probably the one taking the pictures of Dolly and Flo on Sam’s lap. Trying to rile things up. That’s who was behind the camera – poor poor Billy – no birthday love. Wow, there’s something very disturbing about those shots. I’m worried about Billie. That ghostly haze….brrrrr, creepy! Your story nails the subtly twisted vibe. Aren’t these a treasure? Today I read an article about finding a camera with images from a trip to Rome – these are sooooo much better:) Worth every penny of the 4 bucks they cost me. Ha – well, there has to be a story there. 😉 And you are the best story teller! What a fun post! I love your story — your “voice” is better than those of the Trachtenburg Family! Thanks – They aren’t very good singers but they do have a great line now and then.